After my last post on multiple observers, I will discuss another topic related to multiple observers. The question is “What should be the optimal choice of N observers on terrain such that visible region (as many green points as possible by our convention) is maximized ?”. We first define a pseudo code in order to find the optimal (Not guaranteed. Keep in mind that optimization problems are usually NP-complete by their nature) layout of N observers. For simplicity we will assume that all observers have the same height (7 units) which can be relaxed later. Add another random observer ((uniform(-8,8),uniform(-8,8))) and compute the coverage for those two observers (random one and the best observer from Step 1). Otherwise repeat Step 2 to find a better coverage. For number of observers greater than 2 apply the idea in Step 2 recursively. There are some blur points in this pseudo code. We will define those before moving further with the implementation. How to Find Optimal Coordinates of Observers ? Optimization is the process of searching for an N-dimensional vector using a technique to maximize/minimize a function of that N-dimensional vector. N-dimensional vector in our problem is the vector of first to components of observer dimensions. Such as, (x1,y1,x2,y2,…,xn,yn). Technique to be used is the Nelder and Mead Technique (A version of it implemented in R). Function to be maximized is the coverage function which we have defined for a given set of observers. Let’s start by defining the function to be optimized that is coverage of terrain for a given set of observers. matrix routine allows us to create a table of two columns(first two dimensions of observers) and length(observer)/2 rows. We have used the technique discussed in part 3 to compute merged status of observers. 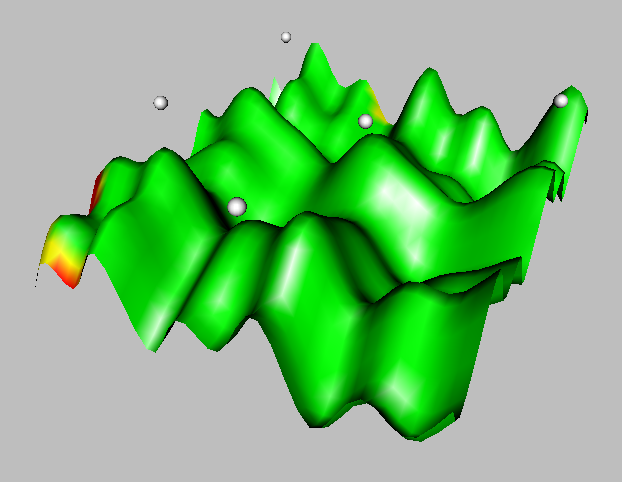 sum(mergedstatus==”green”) call is used to count number of green points on terrain with respect to observers. Next is the computation of first input to be given to optimization solver. That’s because for any optimization technique starting point is critical. Without any formal definition we will use our pseudo code to choose a “good starting point/vector”. Above code is an example to initialize observers vector for searching best 2 observer layout. 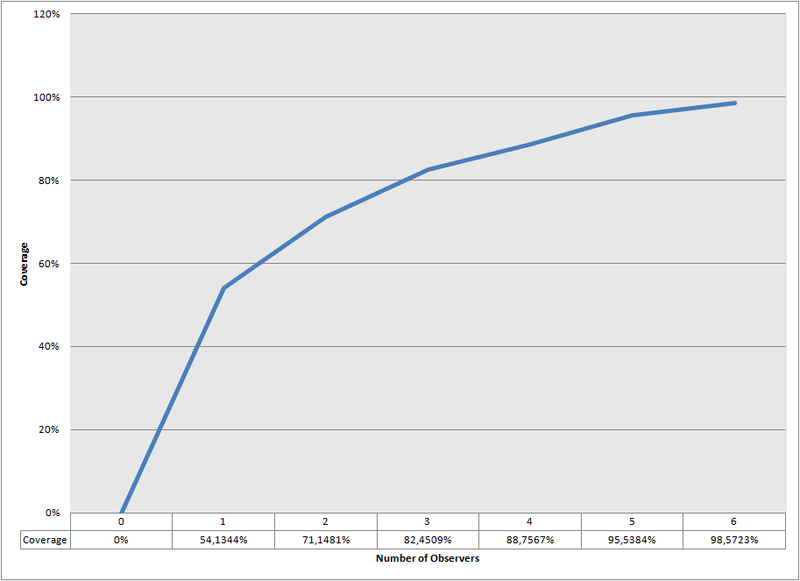 It uses the best coverage ratio for 1 observer case (54.1344%) and adds a new random observer next to best observer found for single observer case. First parameter is the initial value for input vector (prepared by previous code piece). Second parameter is the name of the function to be maximized. optim function is implemented to solve minimization problems by default. Setting fnscale attribute of control parameter turns it to a maximization problem solver. You can test covering more than 98% of whole terrain is not trivial by using only 6 random observers but requires “careful” choice of their layout. Finally let’s check step by step improvement in coverage as we add more optimal observers. 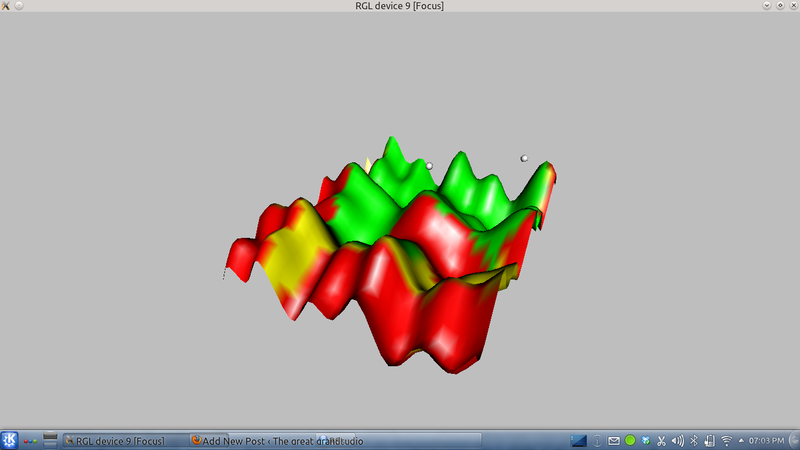 In this part of my LoS Analysis series, I will try to extend 3D LoS analysis for multiple observers. Assume that you drop multiple observers into a terrain with the aim of covering it perfectly (100% green). We will reuse R codes used in Part 2. However we need to add a simple code piece to be used to merge Line of Sight results of multiple observers. 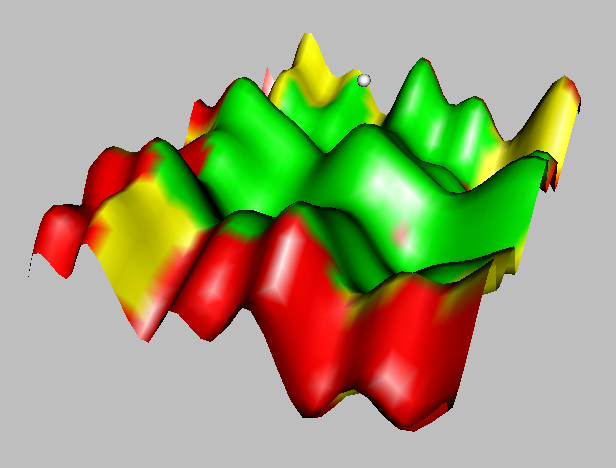 If a point on terrain is visible by any of the observers that means point is visible, if the point is visible but far from all observers that means point is out of LoS due to distance (marked with yellow), for all other conditions point on terrain is red. updatestatus function is implemented for this purpose. In my previous post on LoS Analysis, I have tried to explain briefly the basics of LoS in two dimensional space. Obviously real life problems are based on three dimensional terrains although basic concepts are all the same. In this second part I will try to adapt the same techniques with a few modifications for three dimensional terrains. 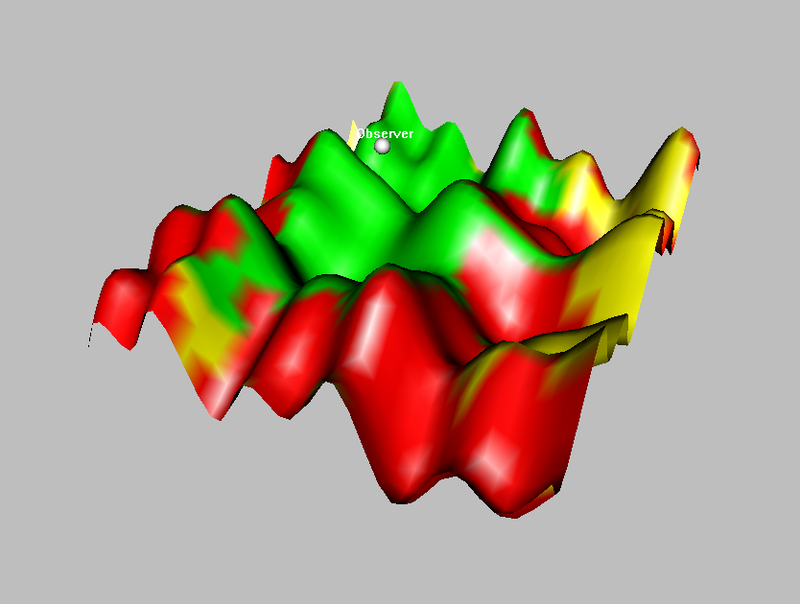 One of the first differences in 3D LoS analysis is the terrain visualization. 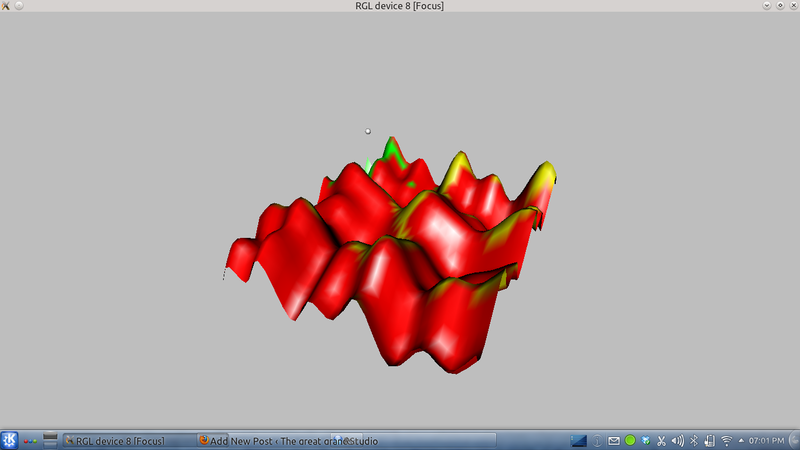 We can not use plot function for proper visualization is 3D. Fortunately R has all packages you need for any type of problem. I will use rgl package which can be downloaded using install.packages("rgl") command. Once you have the rgl package, generating pseudo 3D terrains as we did for 2D is a trivial thing. You can use the following R script to generate your 3D terrains like above. A new function in this script is outer function which generates the product of a vector and a row-vector to have a matrix (product of a row-vector with a vector/column-vector is obviously a scalar value and named to be dot/inner product). The third parameter of the function provides us the mechanism to apply a given function (height in our case) for each element of this matrix. 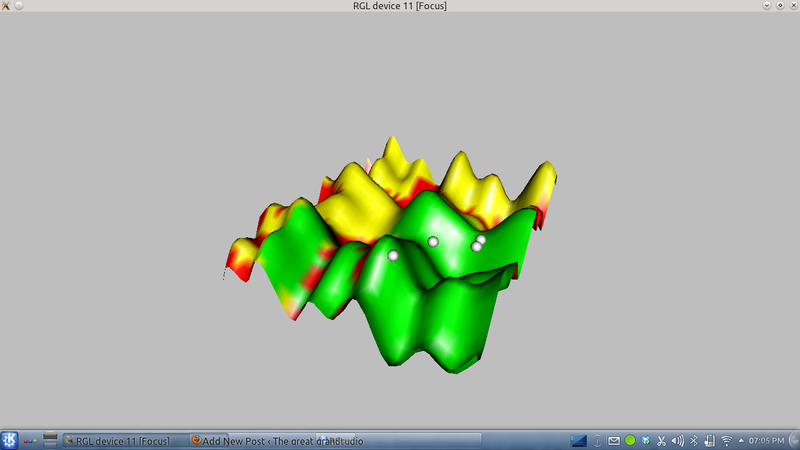 Obviously you can play with height function to have fancier 3D terrains and to have best visualization you may need viewpoint routine in rgl package . status <- "non-LoS due to Distance"
status <- "non-LoS due to Blocking"
The second difference is on height function (Code Lines 5-8). It is no longer a mapping from x to y but a mapping from x,y to z. Rest of the 3D version of script is pretty much the same or trivial to discuss more. 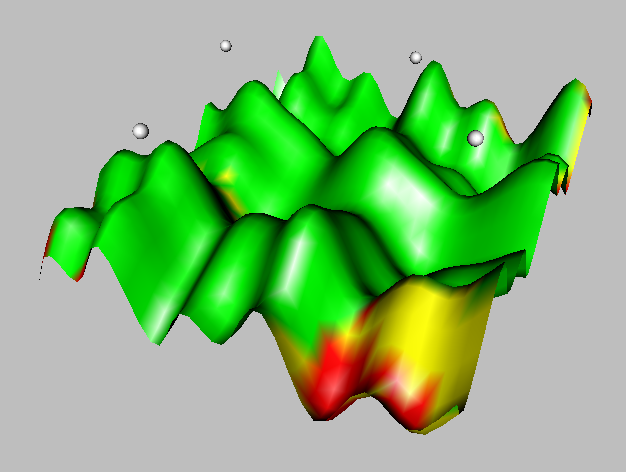 Until this point we have analyzed LoS of a single point on 2D-3D terrains. But usually network analists wish to know LoS map of the terrain with respect to a given observer. In other words we need to visually understand which regions on 3D terrain are visible by the observer, invisible by the observer due to blocking, or further than the limit from the observer. Here the LoS map of our pseudo 3D terrain with respect to an observer with a given set of coordinates and maximum service range(green vs yellow regions). You can obtain this visualization using following R script. 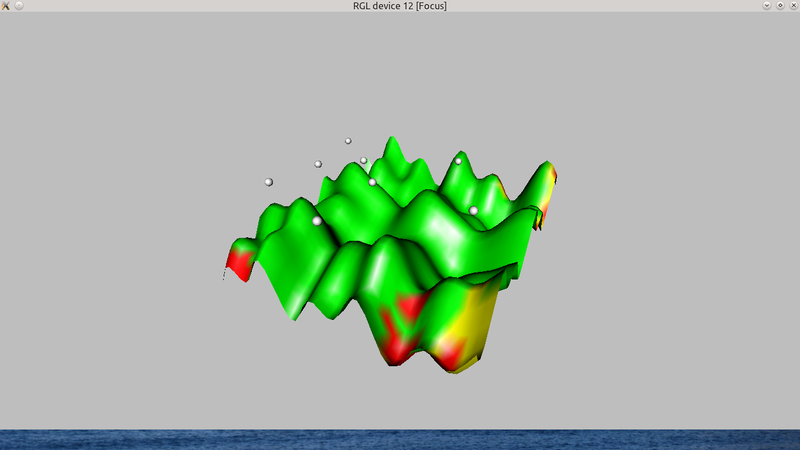 For a better visualization R allows you to implement spinning 3D terrains using play3d function and record it in gif format using movie3d function as I did below. Line of Sight analysis is a commonly used technique in telecommunication industry for A/I (Air Interface) equipment planning and allocation. With the simplest terms LoS is the question whether a point on N-dimensional space is visible by an other observer point. The question can be used to answer where to locate a transceiver on terrain so that it can serve customers on some region A. Before relatively more complicated problems, let’s start with an easy example focusing on two dimensional terrains. Throughout the post, we will use R for coding which is my favorite option for any mathematical problem (statistics, plotting, linear algebra, optimization, etc.). But you can easily adapt coding material to Mathlab, Python,or your favorite language. 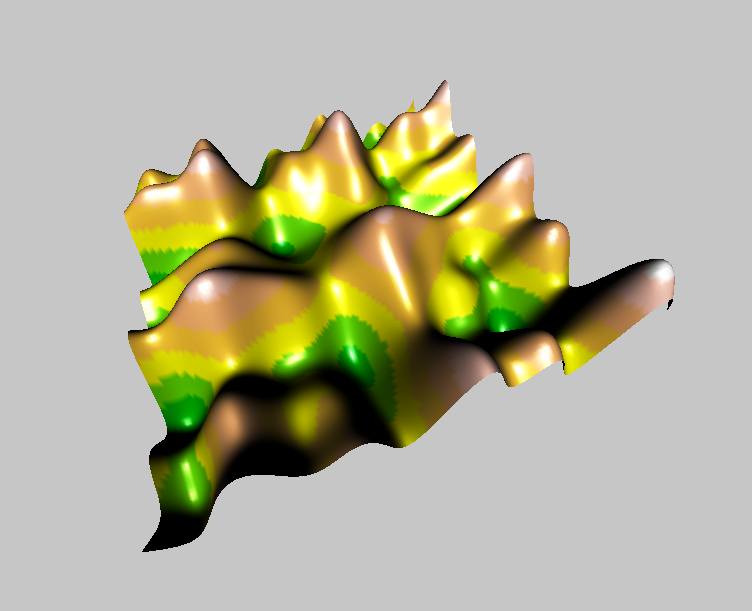 Combining polynomial terrain functions with trigonometric ones will give you fancier ones. You can think that we have already answered this question but this was an informal try which is not very useful for solving the problem. In order to solve this problem methodically we need to understand what makes a target visible (within LoS) by the observer. As you see on Figure 3, green point is within line of sight of observer (blue point). However there is pseudo hill between red point and observer. 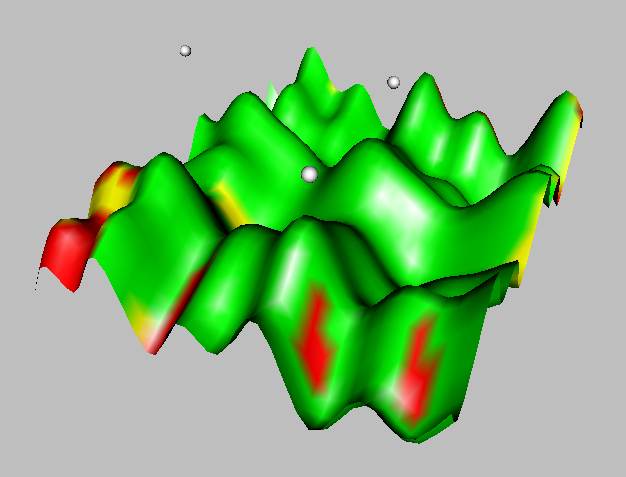 The difference is that the line connecting observer and green point is always greater than the terrain function whereas this is not valid for the line connecting observer and red point (for x ε [~2.5, ~3.5] red line is under the terrain curve). This was the first point (blocking) we should define. The second one is an easier one related with maximum Euclidean distance between observer and target. The distance between observer and target may cause a phase shift in signal if the distance is sufficiently long or depending on weather conditions and terrain properties you may observer diffraction problems (actually there might be more than those). In return this will cause signal quality issues or call drops. On Figure 3, although blocking is not an issue between observer and yellow point, target is out of visible range (say 8 units) of observer. Finally let’s define a method to find all visible, invisible, and “far” points on any terrain. Since it is not “easy” to decide analytically whether the line connecting observer and target “is above” the terrain for any terrain function, we will use a simple numeric method. We will define a step size small enough (around Spatial Tolerance) to generate all x values between observer and target. seq function is a good choice for doing this (Code Lines 33-36). Evaluate these x values for line function connecting observer and target and terrain function. 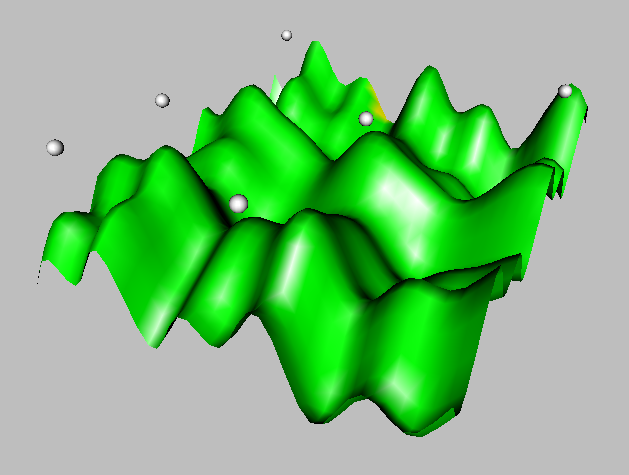 Evaluation is simple for terrain function using height function (Code Lines 4-7). Evaluation of line function is held by function linear using parametric definition of line function (Code Lines 9-14) . Next step is to search for any x value having a line evaluation less than terrain evaluation (Code Line 44-28). The rest is simple as to evaluate euclidean distance and assigning values to status variable.